I am a senior in high school. Since the beginning of this year I’ve held a part-time job, and put most of my money into a savings account. I’m going away to college in the fall on a partial academic scholarship, and my parents and I decided it would make sense for me to work now and save everything so when I go to school I can focus on my studies, and still have some spending money. We don’t have a lot of money, so maintaining my scholarship is really important to me, and to my parents. My problem is, there’s this girl I’ve been dating, and I really want to ask her to the prom. It’s a big deal in my school to do promposals, and I know some guys are planning big ways to ask girls on dates—taking them to a fancy restaurant for dinner, getting their girls specially embroidered his and hers running shoes (so they can be prom-body-ready). One guy got his girl a charm bracelet that spelled out “P-R-O-M” in the charms. Of course I want to make the girl I ask feel special. I’m already planning on the tux and flowers and prom tickets and dinner beforehand, and the limo. And that’s fine, I’m ready for it, I’ve been planning for it. But this seems like so much more extra money, and I know I can’t ask my parents to pitch in with this. They already do so much for me. How can I compete? BnP: First, kudos for the great signature! And your question succinctly nails an issue — a trend; perhaps even an obscene trend — that makes us ca-razy. Is it about the money? Or is it the fact that our young vibrant women feel like they need to be Disney princesses? They need public displays of desirability (and thus, validation)? And how romantic is it that boys are increasingly expected to be nothing but cash cows? (Can we even say how much we hate these two things?) Is it that nothing can simply be what it is? We’ve maxed out the stuff we can add onto the prom (What??? You’re not spending the week at the shore??? ), so we’ll invent this idea called “Promposal”. Let’s see if we can help. Prom-body ready, where’s the fainting couch. B: Give me a minute to congratulate you on earning a scholarship! That’s no small feat. And, congratulations to you and your parents for taking your academic achievement and growth seriously, and making plans to preserve your scholarship eligibility. You’re just in high school, but you’re looking ahead and weighing the variables of your life with a maturity I don’t always see in adults three times your age. I haaaaaaaaaaate promposals. It probably borders on the irrational, and if I were a judge I would in all likelihood have to recuse myself from this case if it came to my courtroom. Luckily, this is an advice column and I can rattle on at will. I can just hear parents now: oh, come on, party pooper, they’re cute! They’re harmless! And who doesn’t want to see “PROM?” spelled out on their front lawn in sparklers? But negotiating the social strata of high school is tough enough without having to add in an extra layer of manufactured courtship. I *swear* this is an idea devised and perpetuated by the wedding industrial complex to train future brides and grooms to go big or not leave the yard. P: Just thinking about this brings back the high school trauma. Yuck. And back then, there wasn’t dinner beforehand, or breakfast afterwards, let alone promposals. Yes Priestess is Ancient. There was just the wondering whether you’d be asked, the fumbling conversation in the hall by your locker and then the agonizing what-will-I-wear. Thank goodness my mother sewed! But a promposal? This is the wedding industry going amok, an extravagant marketing ploy. This is, how to say this delicately… hogwash. That said, here you are. Living in this world. You want to go to the prom. You want to have a good time. You want to go with someone interesting. You don’t want to break the bank. That pretty much it? B: Going to prom can be fun. You get to wear fancy clothes, ride around in a nice car, sit at a big round table with all your friends and eat banquet food, do a little dancing. It’s a way to practice a ritual of adulthood, and fills the niche created by the (now largely abandoned except in certain circles) debutante ball. Prom-goers put themselves out there, displaying themselves as they get ready for adulthood. Practicing at adulthood should also (theoretically, at least) contain an element of practicing what to look for in a desirable partner. Promposals can skew that. Yes, some promposals can be cute. It’s like a storybook, right? Awww. But what they tend to do is put a glossy sheen over the meaningful work of dating, which involves determining someone’s personality. It establishes an expectation that girls should expect to get treated like fairy princesses, and if Prince Charming isn’t riding in and saying he wants to take Terri to the prom with artfully strewn rose petals, then either the boy who’s simply asking (“Terri, would you go to the prom with me?”) isn’t worth Terri’s time, or Terri doesn’t merit a proper asking. Do we really need to reinforce the idea that our sense of self depends on the value placed on how much of a public spectacle we are made by other people? P: Hopefully the girl your dating will be able to appreciate your opinion, if not have the same abhorrence that you do for the crass commercialism. The prom is really about having a fun evening, or should be, and not an opportunity to worry first if your promposal is sufficient and then if your prom-date is sufficient. I hope she’s a wonderful, independent, non-drama princess kinda young woman. I’m sure she’s someone interesting that you’d like to spend a fun evening with, someone you’d like to know for a long time, whether it’s as a girlfriend or as a great friend. B: You said the girl you want to ask is someone you’ve been had some dates with. More than one date. There’s some reason to believe you’re at the very least compatible and share some of the same values. So it seems like you’re looking in the right direction. P: It’s important for you to remember that you have great values. You’re working hard for your future. You’re considerate of your parents. You’ve thought about making it a fun date. Someone’s really going to want to go to the prom with you. Let’s not think about this as a lack in you but rather a positive. You’ve got goals. You’ve got principles. And you’re trying to figure something out. You’re interesting! If your date, who knows you, tells you she don’t want to go to the prom with you because you’re falling down on the promposing, it’s going to be hard on the ego but really, this is likely not someone you want to know really well. 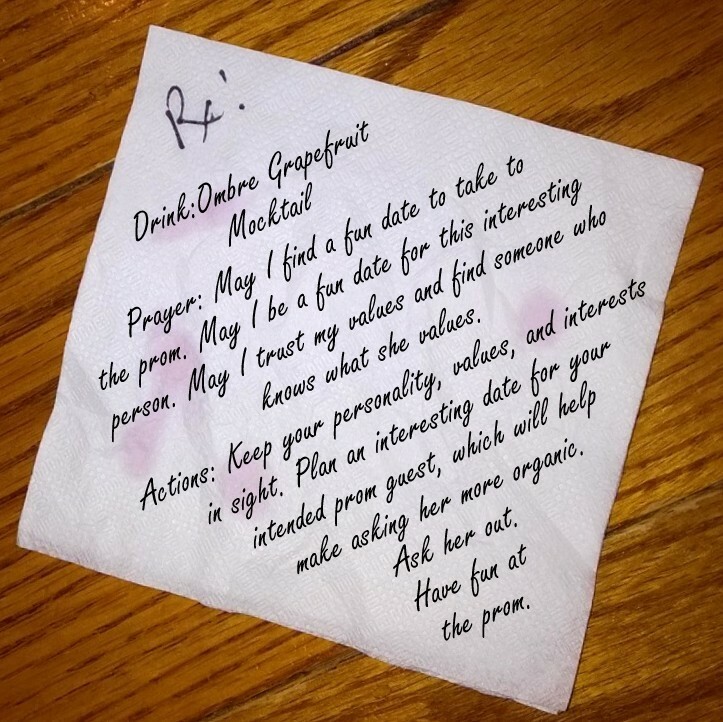 If you have to, go ahead and think about this invitation as a promposal, but why not just think about it’s being asking the girl you’re dating to the prom? Let it be about the two of you. Why not make your invitation one more opportunity to get to know one another better? You’re going to have to talk to one another a long time at the prom. It’s a good idea to keep building common ground. You can be very romantic without spending beaucoup bucks. Do you two share an interest? (hint: it’ll be more fun at the prom if you have things in common). A little research and you can figure something out. This is getting to know someone. This is effort that will not be wasted and will stand you in good stead your entire life. Truth to tell, I find someone’s interest in me far more romantic than someone who throws cash because it’s the thing to do — something that has noting to do with me. B: Again, being willing and able to talk to someone you’re interested in—making the effort to get to know your future date, and not just want someone who looks good on your arm—is a sign of maturity. Of *course* we all want to be attracted, and attractive, to the person we date, but a date can go sideways pretty quickly if all you have is the pleasure of looking at one another. If you wanted that, you could take a picture of that person and put it in your wallet. But your date moves and breathes and talks, so find out what interests her and go from there. P: Looking for ideas? Do you hike? Go some place special, take a picnic. Look for a heart shaped rock. There are loads. Start collecting them. When you’ve got enough hand them to her and say, be my prom date! Take car drives, go see something special. Find two animals in the field together. Ask her to go with you to the prom. Live in a city near a favorite museum? Go see a painting, ask her to the prom. Use your bus passes and spend the day hopping on and off the bus. Go on a picnic. Play a game. Learn to make an origami flower, get really good at it. Do it in front of her, ask her to the prom. Be creative, interested and hopeful. And the origami thing? You’ll always be able to use that! B: I want to take a moment to beg the parents who encourage these sorts of displays, or smile benignly upon them as they’re happening…please stop. Your son is not a gesture-generating ATM, your daughter is not a princess, and we should be working toward raising young adults who are independent, not codependent. There are so many wrong messages attached to the idea of a promposal. As for you, Promplexed, remember, when you go forward into your life, that relationships do not thrive on flashy gestures alone. Be true to yourself, your goals, and your personal value system, and don’t EVER feel like you’ve got less to offer than anyone else because you don’t put bling before substance. Have fun at the prom, and best of luck to you in your future. Prom objective: Don’t get too stressed. Have fun. That is all.